"The atomic mass, ma, of an unbound neutral atom of carbon-12, ma(12C), in its nuclear and electronic ground states is 12 Da exactly, where Da is the symbol for unified atomic mass unit. The atomic mass of 12CC is 12 Da, and the atomic weight of 12CC is 12 exactly. All other atomic weight values are ratios to the 12C standard value and thus are dimensionless numbers." 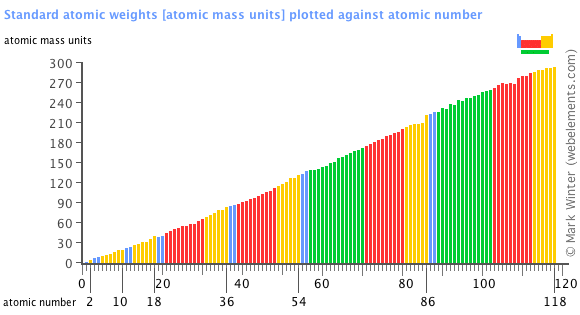 Image showing periodicity of the chemical elements for standard atomic weights in a bar chart. J. Meija, T.B. Coplen, M. Berglund, W.A. Brand, P. De Bi�vre, M. Gr�ning, N.E. Holden, J. Irrgeher, R.D. Loss, T.Walczyk, and T. Prohaska, Atomic weights of the elements 2013 (IUPAC Technical Report), Pure Appl. Chem., 88, 265-291. doi:10.1515/pac-2015-0305.